Dear customers! We are presenting you a newest Handy Backup 7.8.2, which contains such new functions and improvements as a special VMware backup plug-in, a dedicated tool for exporting and importing tasks, and a possibility to use a clear SSL/TLS protocol to transfer files via FTPS (an FTPES extension). We are also renewing a Czech localization for a program interface. This new plug-in allows backing up VMware virtual machines and entire arrays from external, creating a perfect image for each VMware machine. This feature executes backups in a “hot” mode, requiring no stopping for VMware machines backed up. A user can restore and run a snapshot taken by this feature as a standard VMware machine image. This option allows transferring data protected by a SSL/TLS algorithm between an FTPS storage and other data unit. Using SSL/TLS allows protecting the dataset transferred from catching, decrypting or modifying by an external malware. This protocol, sometimes called FTPES, brings a next layer of protection over your data transferred via networks. 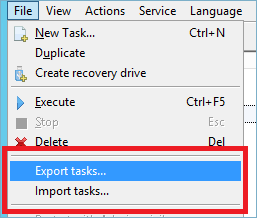 This new feature allows saving a set of your defined tasks as external data, and then restore this set to another machine or to another copy of Handy Backup. Using this option may greatly help when you are migrating, upgrading, re-installing Handy Backup or can lose your tasks by any other way. Actually, this is a sort of “backup” with Handy Backup, where you are saving the list of backup tasks by itself!